During the end of December 2012, after the holiday list for 2013 reached me – I chanced about this weekend of January which had three continuous holidays. Since I saw this almost a month in advance, I decided to book both ways by KaSRTC – getting tickets during weekends is a dream on KaSRTC. By booking both ways, I managed to get a 10% discount, and got a round-trip ticket for a cool Rs. 1666! Private operators charge Rs. 1000-1150 one way. This round trip ticket was really cheap. 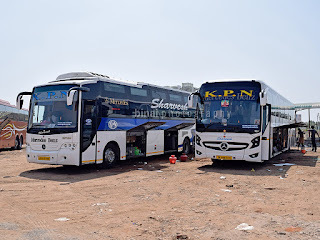 I chose Shantinagar as the boarding point for my Bangalore-Thrissur journey – but later, I was wondering why did I choose the bus station – St. Johns would’ve been better. The KSRTC website allows modification of boarding point through the website upto preparation of chart. I thought I’d take the decision on the day of journey. I had class till evening on that day – quite unusually. I had to rush out of office. Took the NICE road and reached home around 1815hrs. Quickly packed my bag, got fresh and was ready to leave. I left home at 1850hrs – for a bus leaving at 2111hrs!! I rushed to the auto stand, and found no rickshaws anywhere around! Luckily, got an auto that was returning empty – the rick dropped me on Bannerghatta road. Thankfully, there was a Volvo bus standing just past the bus stop, stuck in traffic. The driver opened the door for me. There were a couple of vacant seats. The bus got crowded later. The road was horrible crowded –the driver took the Dairy Circle-MICO-Wilson Garden route, instead of going via NIMHANS-Lakkasandra. The bus reached Shantinagar around 2000hrs. I headed to the Andhra hotel at the bus station for my dinner – the hotel was all crowded, with lots of passengers. Being single, I managed to find a seat quickly. The bus station was chaotic – as usual. I roamed around the bus station for a while. Sometime around 2035hrs, the bus was brought from the depot. The bus was parked in the long queue of buses. The driver was inside the bus, but did not start boarding. Boarding started around 2049hrs – after the conductor came with the reservation chart. The bus was KA-01-F-9346 – the very same bus that I travelled the previous week. Interestingly, the crew were the same as well! I was excited about the interesting journey I’d be having that night. I got into the bus, left my baggage and returned outside – AC was still off, and it was very stuffy inside. The driver kept moving the bus forward as and when the bus ahead moved ahead. Around 2100hrs, the driver switched on the AC. I got back inside the bus and occupied my seat. FM radio was being played. Our bus reached the exit gate perfectly on time – 2111hrs. But we were not yet ready to start – the reason: they were still loading parcels! Our driver was annoyed at the delay – he was shouting at the parcel guys. The dispatching inspectors finally signalled our driver to move – at 2120hrs. The road outside was horribly chocked. After a lot of struggle, our bus finally got moving at 2129hrs. By now, the crew started getting calls from passengers about the whereabouts of the bus. We had less than 20 passengers on board now. The conductor distributed water bottles, and blankets were kept on all the seats. The bus waded through traffic and we reached Dairy Circle at 2144hrs – only one passenger got in here. The area around Forum mall was all jammed up – we reached St. Johns, Madiwala at 2154hrs. The bus more or less filled up here. We started moving at 2157hrs. Roads were less crowded from here on – thankfully. I was expecting massive snarls at Bommanahalli – but I was proven wrong. The roads were free hereon, except for mini blocks at traffic lights. We reached Electronic city at 2219hrs – that was less than 20 minutes from Madiwala – a record for sure! All seats, except two, were filled now. We left Electronic city at 2222hrs. No movie was played (thanks for that) – but the FM station was still on. I was too sleepy – I slowly drifted asleep. I saw someone rushing to the cabin – the crew switched off the FM radio now. I remember seeing the bus stuck in traffic block at the TN checkpost (Zuzuwadi) – I continued sleeping. I woke up just when the crew announced a dinner break – the time was 2358hrs, and we were at A2B restaurant (Chinnar) instead of the usual Krishna Inn, Shoolagiri. I was too sleepy to get up or move out of the bus. The AC was still on, so I continued sleeping. I did not know when the bus started off again. I had a nice long undisturbed sleep. I woke up only at 0533hrs – when the crew announced another break! I could see the “Amrita Vishwavidyapeetham” board – meaning we were at Ettimadai already! Oh! It would be better to say we were still at Ettimadai! The bus was supposed to be at Thrissur now. I got off the bus at this break – for a short stroll and a leak. The Bangalore-Ernakulam “Non-stop” B9R was also present there. The crew came back and we started off at 0543hrs. The road ahead was broken and in poor shape – the bus swayed badly. I was awake till we crossed Walayar checkpost. I drifted asleep again. I woke up only when the conductor shouted out “Palakkad”. The time was 0622hrs – and we were outside Palakkad KSRTC bus station. My co-passenger too got off here. Quite a lot of passengers alighted here. We started off at 0625hrs. KaSRTC buses take a different road to get back to the highway – not the normal route that KeSRTC buses take. I have still been not able to trace this route. I slept off as the bus came back to the highway. I did not even realise when the bus went through those horrible patches around Kuthiran. The bus stopped at Mannuthy to drop a passenger – 0741hrs. I pulled up my backrest and got set to get off the bus. I moved to the front as the bus passed East fort and entered the ring road. I was dropped outside Sakthan Nagar Private Bus station at 0750hrs. Before getting off, I noticed the trip meter – it read 464.1kms. End remarks: The bus was KA-01-F-9346, of Bangalore Central Depot-4. The odometer read around 1.99lakh kms. The crew were good – the conductor was a bit ill-tempered and talked very loud. The crew was silent – he meant business. The end-to-end running time was very high – at 10hours and 21 minutes, for a 464.1kms distance. I am sure something was wrong on the route – because the driver was fairly aggressive on the road. Driving was very stable – absolutely no use of horn at night, and no rash braking – the fact that I slept undisturbed for over 5 hours is a testimony to that. 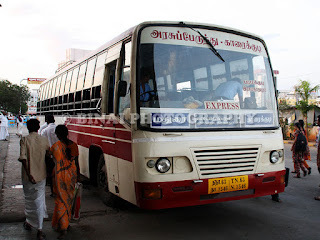 Most of the delay happened in the Attibele-Chinnar section – the bus was a whole hour late for Dinner break. I have always, and still, wondered why a bus starting at 9pm should require a dinner break on the way. Instead of wasting over 25 minutes on a dinner break, they could stop the bus at a good fuel station or a toll station for a quick bio-break instead. The break at Ettimadai is unwarranted as well – there is absolutely no toilet facility there (except talking to the wall). KSRTC needs to work on these breaks and understand the fact that weekend passengers would love it if the bus sticks to its timetable – we reached over two hours late at Thrissur. Will I take this service again? The driving style was good – I might try service this again. Well narrated. I was a big fan of KaSRTC Airavats in the past, regularly taking EKM Non Stop in both directions. This according to me is the only bus which does something in terms of punctuality. They seems regularly overtaking TSR,PLKD Airavats within TN itself, sometimes EKM Merc too, & makes a 9.5-10 hour end to end journey. I missed what I was going to tell you-I know the route which KaSRTC takes to exit Palakkad. I am very familiar with that place since I did my LP School there. They would never enter the bus stand but takes left just before KSRTC Bus Stand(Next to the Petrol Pump). This is Yakkara Road. After a few minutes at Yakkara they takes right-next to St.Marys Church & School(My School). To the left you can see a railway gate while turning (Old MG Line). This road is Palakkad-Kollengode/Koduvayur Road. Then they again takes right at a place called Kinassery(If my memory is correct) where they divert from Koduvayur main road to the Old road (Vadavannur-Koduvayur). Again after some twists & turns you can see the Old MG Rail Bridge to the left. Finally at a place called Kazhchapparambu, again right to NH. Its wrong to say that KeSRTC won't take this route. I have seen TVLA Dlx & Garuda always favouring this route in both directions. They do go upto KSRTC Bus Stand. The route they take is KSRTC Bus stand -> Mercy College Jn - > left there, and run towards Yakkara. They don't actually cross Yakkara bridge, but they cross the river somewhere else, and come out near Palana Hospital, on the highway. I remember seeing this hospital when we were entering the highway. I did not say that keSRTC does not take this route - I said this is "not the normal KeSRTC" route. Their normal route is via Manappullykkavu-Tipu Fort-KSRTC. The route which you are saying is almost the same which I said. Whatever I said is while travelling in 19.45 Merc to EKM,TVLA Dlx,Garuda,KTYM Exp a few months ago-I think they didnt think of Hospital route that time. 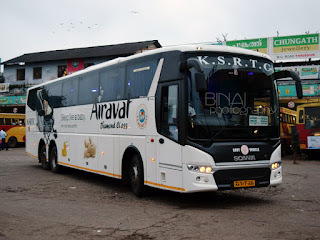 They didnt went into the stand-I clearly noticed-however Garuda & TVLA goes to refuel-I have seen them backing to the same route(not via Mercy Clg).Earlier I have seen Airavats going upto Kotta Maidanam only, and reverse there to Manappullikavu. The route you said after Yakkara some twists-goes straight to the highway(Hospital)-This road is little narrow and goes under MG line-without taking the right to old bridge. You can see the old bridge for sure in the right. Near Hospital again to NH-next minute the bus takes over the new bridge in NH-This time MG line is seen right side. After a minute MG line goes under the NH with a road in parallel-this road comes via Old Bridge(left from Kinassery).If you go by old bridge-right from Kinassery- then you will enter the NH automatically at next Jn-Kazhchapparambu. This route which I am telling is the default route for Koduvayur buses & Ordinary bused from Alathur/KSRTC from Kuthannoor in day hours. 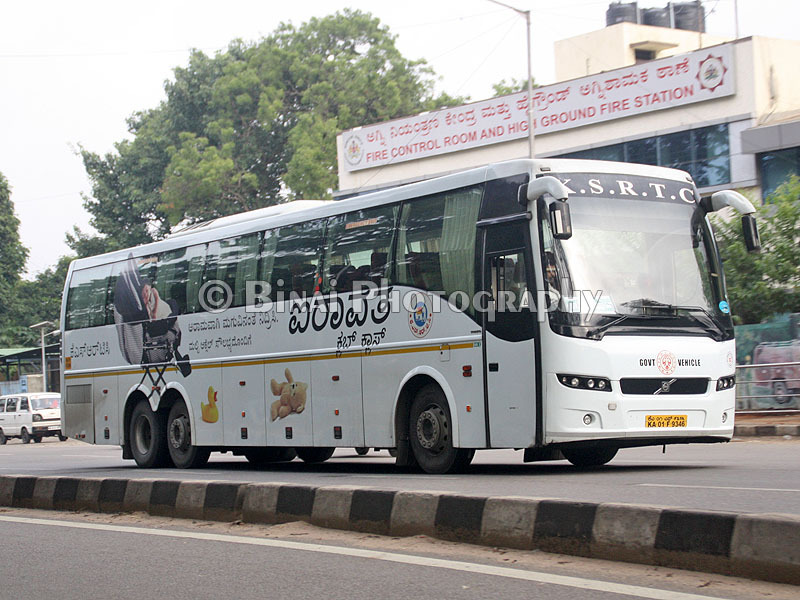 TSR-PLKD LS/KSRTC goes via Manapully. I talked of Paalana Hospital, not Malabar Hospital. The route you said (under MG tracks) goes to Malabar Hospital. Oops confused with two hospitals. I thought the exit to NH as seen in the map is little difficult to turn right as the NH lies little up, think there is a slight gradient up to NH. Guessing this I thought that the driver wont risk this way & bus went via Malabar Hospital. But this route seems twisty. The route I mentioned first seems better(?). 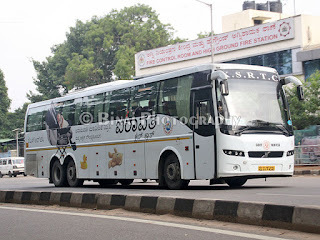 First time to Bangalore, return by KSRTC same day. Please help locate St. Johns Hospital BMTC bus stand. Is it the bus stop that comes immediately after BDA Complex in google maps? I am perplexed whether the pickup is @ BMTC Bus stand or it is St John Hospital bus stop? both are nearby though.